Never have I seen such a cast of characters in an election. Tonight 10 of the 17 (17?!?!?!?!) Republican presidential candidates will take the stage in Ohio for the debate set to air on FOX News at 9 p.m. EST/ 8 p.m. CST, and my bet is that it will be very entertaining (oh, and hopefully informative too). I’m expecting the unexpected, but also definitely expecting egos to be on parade. But hey, at least Trump doesn’t have to worry about former Gov. Rick Perry’s hair “trumping” his, since Perry lost out on making it onto that Ohio stage. Who’s in and who’s out? 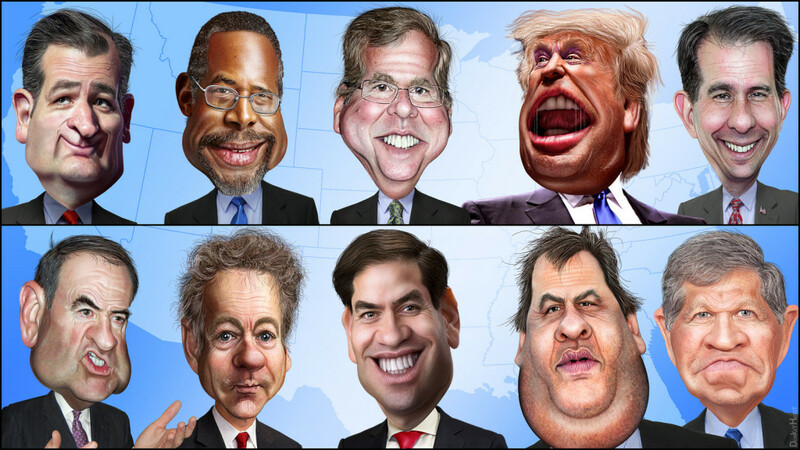 A rundown of the candidates included in the first GOP debate. I didn’t know Hillary attended Donald Trump’s wedding until recently…and sat in the front row! Bet she’s regretting that now! Speaking of the Clintons, they apparently have a long history of being chummy with (and accepting money from) The Donald. So when will it be the Dems’ turn? Glad you asked! They released their debate schedule today, much to Bernie Sanders’ and Martin O’Malley’s dismay. The fun for the Democratic presidential candidates begins in October.